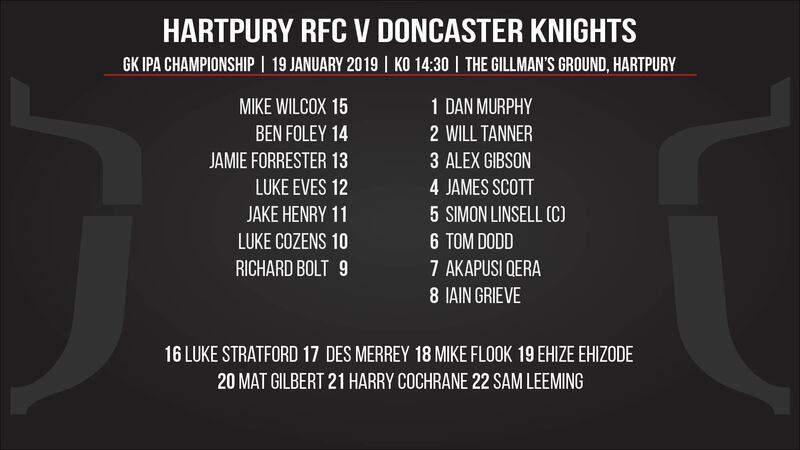 Hartpury have made five changes to their starting line-up for the visit of Doncaster Knights to the Gillman’s Ground, on Saturday. Mike Wilcox returns to the full-back jersey, with Ben Foley switching back to his duties in the right wing. The only other change in the back division is at scrum-half, where Richard Bolt replaces the absent Charlie Chapman. Jamie Forrester and Luke Eves swap shirts in the centres. In the front row, Rupert Harden’s injury means that the return to fitness of young tight-head, Alex Gibson, is timely. The back five is freshened up by two dual registrations from the Worcester Warriors. England Under-20 lock, James Scott, makes his first appearance since the Championship Cup in November, while back row forward, Tom Dodd, is named for his Hartpury debut at 6, with Akapusi Qera moving across to the open side. The bench, in general, has a familiar look, although Bristol Bears lock forward, Ehize Ehizode, will be making just his second appearance in the Red & Black, after being named as the sponsor’s man of the match in his previous outing. Saturday’s game kicks off at the usual time of 2.30pm.